Are you bored of usual looking text display? Besides the vertical text in Photoshop, there are number of ways to stylize and play around with text. You can rotate, bend, skew to wrap text in different shapes for a unique looking text display on an image or a blank canvas. 1. Open Photoshop, Goto File > Open (or New). 2. 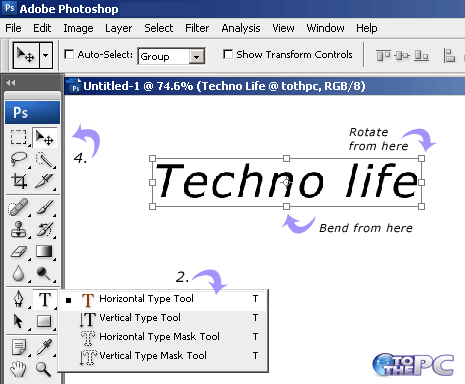 Right Click ‘T’ icon & then left click to select ‘Horizontal Type Tool’. 3. Click on canvas or open image & start typing text. 4. Then click on ‘Move Tool’ (2nd icon on the left toolbar). 5. Press Ctrl + T keys to activate transform. 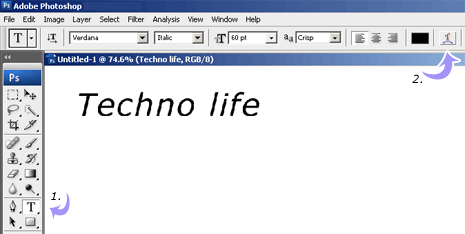 Grids will appear on the typed text. Point and drag the mouse at the corner to rotate text in any direction. 1. Repeat above steps 1 to 5. 2. Point and drag the mouse in the middle of side to increase / decrease height. If you want to increase / decrease uniformly width and height wise – then press down shift key and drag in or out the text from either corner as display by grid structure. 1. Click Text tool on the left & type text on the canvas or image. 2. Click ‘Create Wraped Text’ tool at the top menu. 3. A new window will open. Select from existing styles or create own by moving slider for: bend, horizontal distortion and vertical distortion. Hi thanks, but I have got the same problem – the text has jagged edges. Any ideas? Hello, the tutorial was helpfull but how do I rotate text in Photoshop without getting the jagged edges?